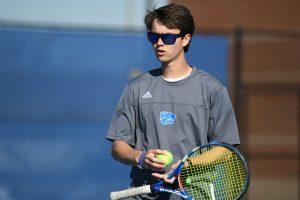 The Wilson Central tennis teams took huge steps toward clinching playoff spots in the team district tournament, when both teams prevailed over visiting Beech on Friday evening. 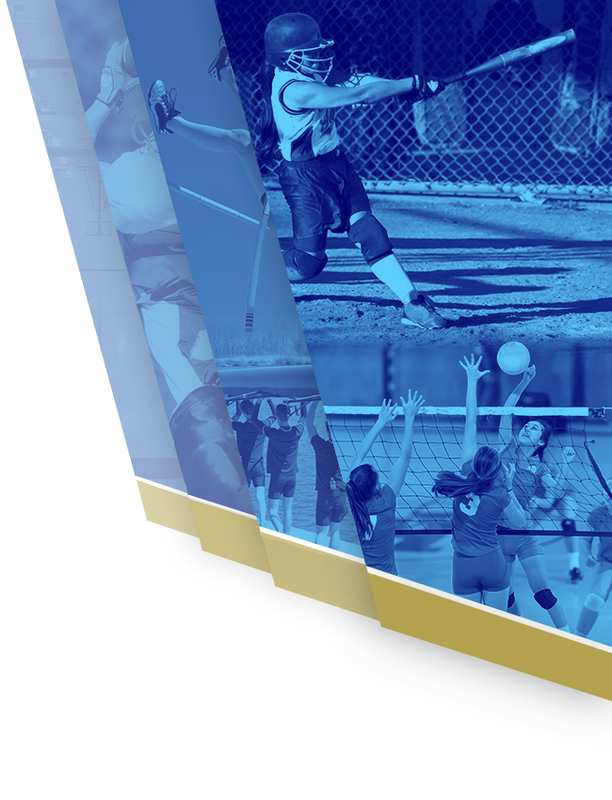 The Lady Wildcats ran out to an early lead before dispatching Beech for a 7-0 win, while the Wildcats grabbed an early 3-1 lead before holding on for a 4-3 victory. 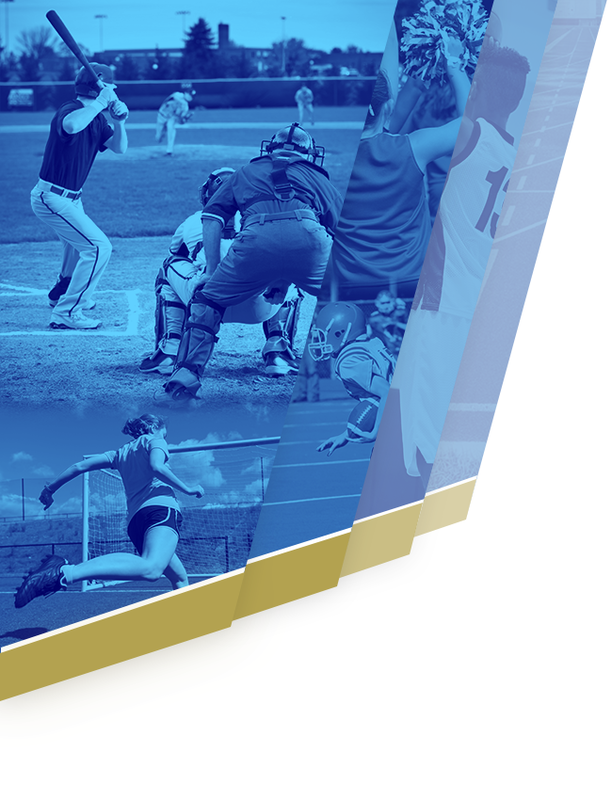 “We started off with a lot of work to do, and we’d come to practice and put in the work which we did a lot of,” Wilson Central senior Braden Hammer said of his team. Wilson Central grabbed both doubles points as Hammer and freshman AJ Hughes rolled to an 8-0 win over Spencer Abbey and Mason Adams at number two doubles. Senior Andrew Denning and junior Michael Mercante leapt out to a 7-2 lead against Beech senior Chase Dorris and sophomore Camden Foster. However, Dorris and Foster got on a roll, ripped off the next four games, and closed in on the Wildcats. Denning and Mercante steadied the ship and earned the last point for an 8-6 win at one doubles. The duo is now 8-1 on the season with an eight-match winning streak. Freshman Caleb Brown found himself in a battle with Beech’s Daichi Kobayashi as Brown dropped the first set 6-2 before winning the second set in a tiebreaker 7-6 (3). After a back-and-forth 10-point tiebreaker for the third set, Brown held a match point at 9-8. However, Kobayashi managed to take the final three points of the match for an 11-9 outcome at number five singles. 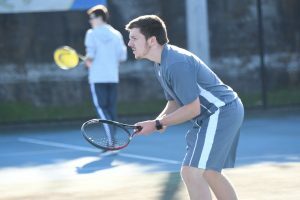 At number one singles Mercante, quickly put Wilson Central to within a point of clinching the overall win, as the junior took down Dorris 6-0, 6-0. With the match hanging in the balance, Hammer picked up his fifth-straight singles victory with a 6-3, 6-1 win over Adams at number three singles. “I’m glad I didn’t know that the match was depending on me so I could just focus on playing,” Hammer said laughing afterwards. Denning suffered a 7-6 (6), 6-2 loss to Foster at number two singles, while Hughes dropped 7-5, 6-2 to Abbey at number four singles. The Lady Wildcats grabbed the first two points with ease against Beech in doubles. 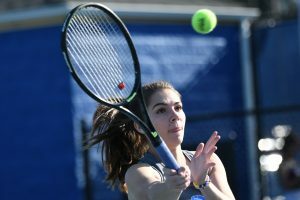 Wilson Central earned its first point as the duo of junior Sydney Miller and freshman Ashlynn Staggs toke an 8-1 decision over Anna Brynn Carmeal and Maycee Woods at two doubles. Wilson Central juniors Jacey Staggs and Savannah Westbrook claimed an 8-3 win at one doubles over Kacey Beier and Erin Davidson. Jacey Staggs gave Wilson Central its third point with a 6-0, 6-2 win over Davidson at number one singles. Miller clinched the match with a 6-4, 6-4 victory over Cameal at three singles. Shortly after Miller’s victory, Westbrook added another point with a 6-1, 6-3 outcome over Beier at two singles. “We get pushed by the coaching staff, and we have teammates that are full of love and support each and every day,” Westbrook said of her team’s improvement. Abby Moser took an 8-0 win over Woods at number four singles, while Ashlynn Staggs also claimed an 8-0 victory over Sydney Sandefur at number five singles. Juniors Makayla Posey and Kaylee Wilson and sophomore Kiersten Moss won exhibition matches for the Lady Wildcats. “We’ve put ourselves in a good situation as a team going forward throughout the district schedule,” Wilson Central coach Ryan Jent said. 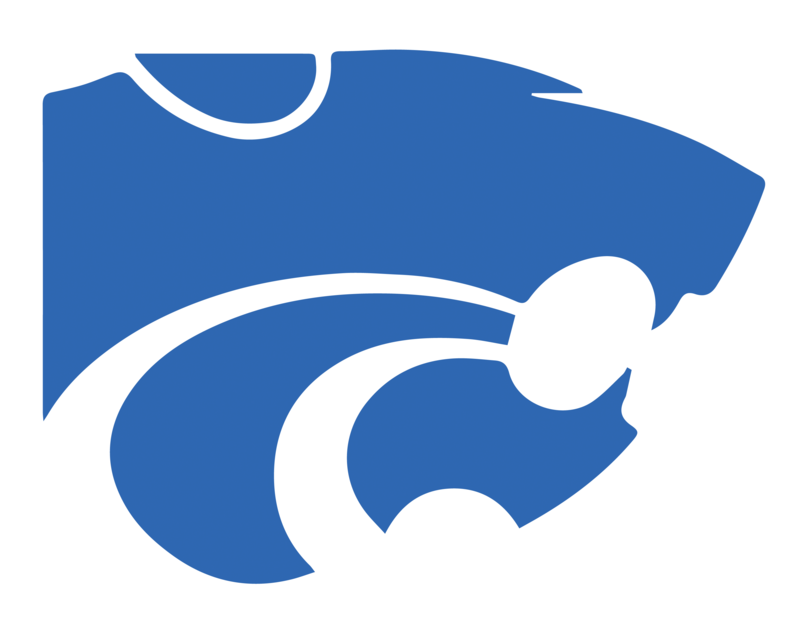 Wilson Central will be on the road all week as the Wildcats take on Nolensville on Monday before visiting Mt. Juliet on Tuesday. The Wildcats hit the road for a trip to Siegel on Wednesday and a visit to Franklin on Thursday before finishing up the week at Gallatin on Friday. With Friday’s win, the Lady Wildcats sit at second place in District 9. At 7-1, their lone district loss came at the hands of undefeated Hendersonville. On the boys’ side, Wilson Central currently sits in a tie with Mt. Juliet for third in the district, as both teams have losses to Lebanon and Hendersonville. Only the top four teams make the district tournament.